UNITED STATES POSTAGE STAMPS illustrate more types of ships than the stamps of any other nation. The voyages of Columbus, of Hudson and of the Vikings, the opening of the Panama Canal and many other famous incidents of sea history can be illustrated by a collection of these stamps. NEARLY all the maritime nations of the world have issued at one time or another postage stamps that picture some form of ship or boat. Some are crude and inaccurately drawn, others are nautically and artistically correct. The United States heads the list of nations with the greatest number of stamp designs, incorporating pictures of ships from a Norse galley to a modern mail liner. Portugal has probably issued the next greatest number of ship stamps. Although most of the British Dominions and Colonies have issued stamps that illustrate various types of ship, Great Britain, the supreme maritime nation, has never issued a design showing a ship. The only signs that British stamps show of any connexion with the history of the sea or its tradition are the dolphins under the head of King George V, and the anchor watermarks in issues between 1853 and 1883. Two anchor watermarks were of the crude outline shown in the illustration (1) on this page. The other two designs showed the conventional “foul anchor” (2). 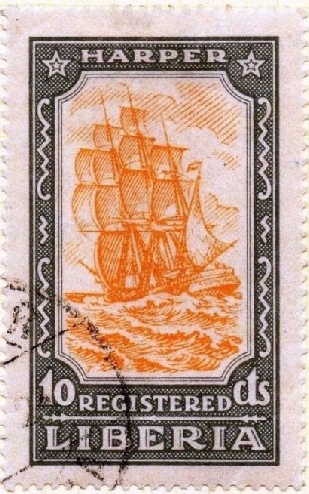 THE ANCHOR WATERMARK (1) was used in high-value stamps of Great Britain issued in 1882-3. The “fouled anchor” watermark (2) was used in 1853 for fiscal stamps that were authorized for postal use in 1881. 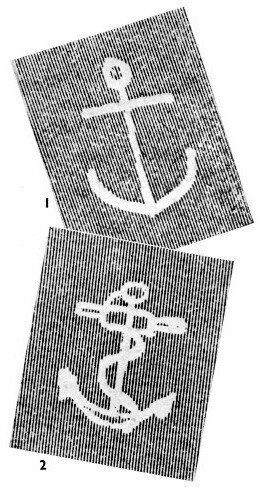 In this watermark design the cable was drawn twisted round the anchor’s shank and flukes - i.e., made it a “foul anchor”. This anchor is so “fouled” by its cable twisted round shank and flukes that if it occurred in real life the first pull would force the anchor from its hold and leave the ship to drag her anchor after her into disaster. At the other extreme from this meagre hint of British sea power and tradition, the stamps of the United States of America show that the U.S. Post Office authorities have taken every opportunity to illustrate the maritime history of their nation. 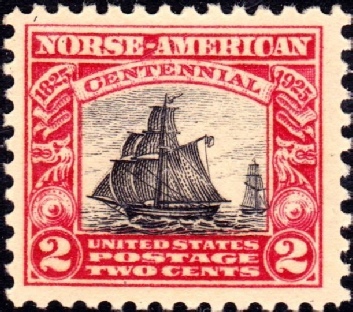 In a collection of U.S. stamps will be found recorded the exploring voyages of the Norse Vikings, the discoveries of Columbus, Hudson and other navigators, the launch of America’s first steamship, the building of the Panama Canal and, finally, the types of vessel in use as ocean liners, lake and river steamers, or as mail boats and tenders. The oldest form of sea-going vessel known to have existed is illustrated in a Liberian stamp (3). Archaeologists have discovered that the first type of boat is represented in a terra-cotta model excavated in Egypt and known to have been made about 5000 B.C. - say 7,000 years ago. It is almost identical in shape and design with many of the dug-out canoes in common use to-day amongst the tribes of West Africa. These natives make their canoes exactly as the Egyptians did 7,000 years ago, by taking a straight tree-trunk and burning or chopping it out into a hollowed boat-shape. 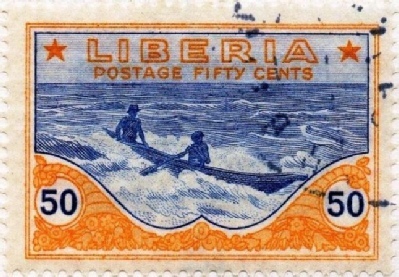 (3) THE EARLIEST SEA-GOING VESSEL was a tree trunk hollowed out into the shape of a canoe, similar to the native canoe shown in the 50-cents stamp of Liberia issued in 1921. Interesting representations and drawings of the ships of the early dynastic days are common among the monuments of Egypt. 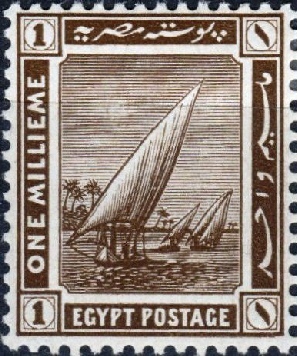 The Egyptian postage stamp illustrated (4) shows an early ship under oar and sail power. It is copied from a mural picture in the temple of Deir-el-Bahari, which dates from about 1500 B.C. The details of the original may be seen and the picture gives interesting information about the early types of hull, rigging and sails. From the number of rowers, and also by comparison with the many other drawings and models excavated from various tombs, it is estimated this vessel would have been about 70 feet in length, with a breadth of about 18 feet and a depth of 4 or 5 feet. The line that rises from near the bow and passes along to the stern above the heads of the rowers represents a heavy rope supported on crutches or “queen posts”. It was designed to relieve longitudinal strain and to prevent the ends of the vessel from dropping or “hogging”. When this rope truss was in position, it was tightened by passing a short spar through a loop in the rope and twisting it round. The big single square-sail is stretched between the supporting upper yard and a heavy lower yard to spread the sail to its full width. To the upper yard are made fast ropes brought down to the deck. These ropes allow the yard to be hauled round to either side of the mast so that the sail could be trimmed to the angle that catches the wind. Every square-sail has been rigged in this way. (4) THE EGYPTIAN STAMP issued during the International Navigation Congress in December 1926 shows an ancient sail-and-oared vessel drawn on the wail of the temple of Deir-el-Bahari and dating from about 1500 B.C. In the illustration of the ancient Egyptian ship it would seem that the vessel is sailing with the wind at right angles to the ship’s course. It is certain, however, that such a vessel of shallow draught, and with a single mast stepped amidships, could never have made a foot of headway. The explanation of the sail’s position in the picture is simply the convention of old Egyptian art; by which perspective was evaded. The artist drew every detail in one dimension and plane, regardless of whether he could so see it from the angle of his drawing or not. A square sail of this type could be used only with the wind well astern and not at all with the wind broadside on or a little ahead. It came to be displaced, therefore, in Egypt and the Mediterranean by the fore-and-aft felucca or other rig of a high-pointed triangular lateen sail (5), a type that is common on the River Nile to-day. 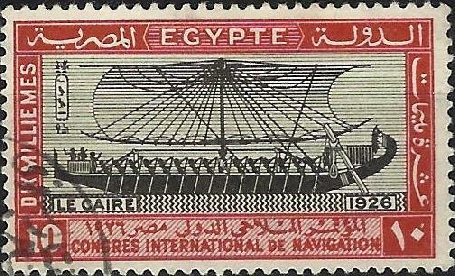 (5) THE LATEEN SAILS still in use to-day in the native craft on the River Nile are shown to full advantage in the 1-millieme Egyptian stamp issued in January 1914. The lateen sail can make use of a following wind or can be hauled round to suit a beam wind. It is a matter of some dispute or doubt whether this lateen sail was developed in Egypt from the old square-sail, or whether it was introduced by the Arabs, who in their turn had derived it from the Far East. One theory is that the Egyptian sailors found the square-sail best with the wind astern, but with the wind in any other quarter better results were obtained by hauling down one side of the sail to the deck and pointing the other side high in the air. In time they came to adopt the pointed lateen that could be set athwartship in a favouring wind, or hauled round to fore-and-aft position if the wind was abeam. The other theory is that the lateen sail was introduced by the Arabs, to whom it had come by way of the East Indies, India and Persia from the Pacific Islands. In postage stamp designs may be seen types that seem to support either theory to some extent. 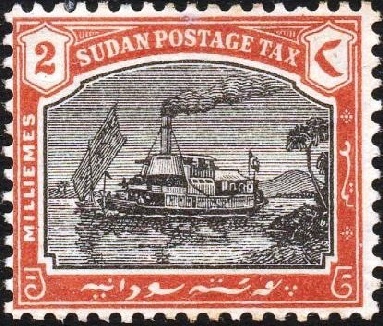 In the Sudanese stamp (6), although the main subject is an armoured river steamer, there is also a native boat with a sail that closely resembles the widespread square-sail of the 4,000-years-old craft. One corner of this sail is hauled down to the deck and the other points high up in the air. The position of the mast has been shifted to make better use of the fore-and-aft trimming. (6) ARMOURED STEAMER on the River Nile, illustrated in a Postage Due stamp issued by the Anglo-Egyptian Condominium of the Sudan in 1901. The rigs of Egypt, gradually spreading down the coast of the Red Sea, would meet and mingle with the Arab types of rigging. We see a further stage in the development of the triangular lateen sail in a stamp of Zanzibar (7). If the sail of the outrigger canoe on this stamp is examined closely it will be seen that the yard does not extend down to the lower point of the sail as in a true lateen, and that the whole sail is a type of wide square-sail carried up in its after and top edges to form the top part of the lateen triangle. The “outriggers” that prevent the narrow canoe from overturning in a beam wind show another development in shipbuilding - the method of giving stability against sideways wind or sea pressure. The outrigger frame is the embryo form of the ribs and beams that allowed a ship to be built of any width in proportion to her length. 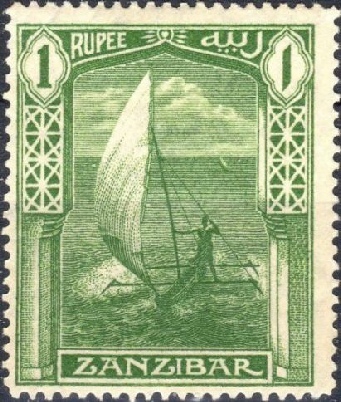 (7) THE OUTRIGGER CANOE in this Zanzibar stamp, in use 1913-23, has a triangular sail that is a development of the Egyptian lateen sail illustrated in (5) above. This appears to support the belief that the lateen was derived by the Egyptians from their square-sail. On the other hand it is certain that the lateen sail was in use in the Pacific Islands in the earliest years. When white men first arrived there they found the lateen in common use, and were told that this traditional sail had “always” been used. A commemorative stamp of New Zealand (8) pictures the traditional story of the arrival of the canoe Te Arawa and her companion vessels after a voyage of about 2,000 miles from the Cook and Society Islands. Details of this voyage have been handed down by tradition, and it can be taken that the drawing of the canoe and her rig is reasonably accurate. The Te Arawa was the most famous of the canoes that tradition says brought the Maoris to their islands, The date of this canoe was about A.D. 1300, but there are records of others that date nearly a thousand years earlier. It is probable, therefore, that the fore-and-aft sail was in use in the Pacific from the earliest times, and- that the Islanders were enabled by it to make their long journeys with the prevailing trade winds strong on the beam. We know that their craft were making such long ocean voyages centuries before European mariners dared venture out of sight of land, or make progress with a beam wind or against a head wind by tacking. (8) ACCORDING TO TRADITION, a Maori canoe named the Te Arawa first brought the Maori settlers to New Zealand from the Cook and Society Islands 2,000 miles away. 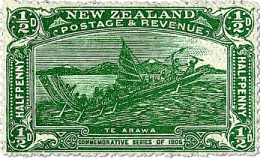 This stamp was issued in 1906 to commemorate the New Zealand Exhibition held at Christchurch. Tradition and legend again tell that there was regular communication from time immemorial between certain groups of the Pacific Islands. The line of communication lay straight across the one unshifting direction of the prevailing trade winds, and only the fore-and-aft lateen sails would have made it possible for the canoes to have sailed at right angles to such a strong, steady wind. It may be, therefore, that the lateen was first known in the East and was brought by the Arabs to Egypt and Europe. After the Arab conquest the lateen came into general use in the Mediterranean. It was later partly adopted all over Europe, and persisted for many centuries in the ocean-going three-masted caravels of all nations. Carried on up to the eighteenth century, in time it developed into the “spanker” sail of square-rigged ships of the present day. It was the inclusion of such fore-and-aft sails that made possible the ocean voyages of Columbus and his contemporary navigators, because without it their clumsy, full-bodied craft could never have voyaged across the Atlantic and back. The square-sail, however, was known in Eastern waters for more years than history records. The Chinese sailor has held to his box-built square-sailed junk from the earliest times down to the present day. It may have been his refusal to adopt fore-and-aft sails that prevented the wide spreading of a Chinese civilization by long voyages and overseas colonization. The Chinese were skilled and scientific enough in other maritime matters, for it was from China that the white races are said to have obtained the mariner’s compass that allowed the navigator to strike out from the guidance of the coast lines into the uncharted oceans. (9) THE SQUARE-SAILED JUNK of China has not altered for thousands of years. This well-known stamp design appeared in the lower values of issues between 1913 and 1926. Although the Chinese scorned the fore-and-aft sail, they at least knew more than the earliest Egyptians of the advantage of using several masts and sails in different positions. 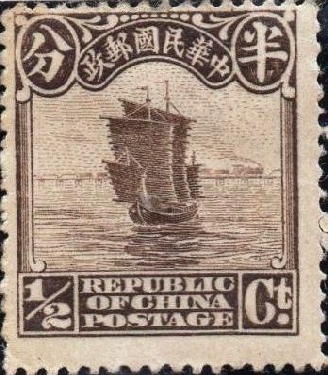 In the stamp illustrated (9) we have a good picture of a Chinese junk. The junk’s four sails are of a size and placing that came to be used only hundreds, if not thousands, of years later in Europe. The small sail on a mast stepped right up in the bows and leaning well forward is the equivalent of the square-sail set on a yard across a highly steeved bowsprit, first known to Europe in Roman ships dating from about A.D. 100. This sail, called artemon by the Romans, who borrowed the name from the Greeks, was the most important and valuable discovery made in sailing since man first used the wind to propel a vessel. With a single mast and square-sail, only a following wind could be used; but the second sail, set at the extreme forward end of the ship or leaning out a little before it, balanced the sailing and allowed a quartering or beam wind to push the vessel forward. It is extraordinary that this invaluable discovery of the artemon should have been discarded after a short period. Its use was forgotten for centuries, only to be rediscovered as something entirely new and installed as a bowsprit-sail in the time of Columbus. It was displaced again by the jib-sails set between foremast and bowsprit or jib-boom. It finally returned as an extra fair-weather sail set below the bowsprit in the famous racing clipper-ships of the China tea trade, which had the finest form and rig of sailing ship that man has ever made. (10) VASCO DA GAMA’S FLAGSHIP, the Sao Gabriel, was the ship in which he rounded the Cape of Good Hope and discovered the route to India in 1498. 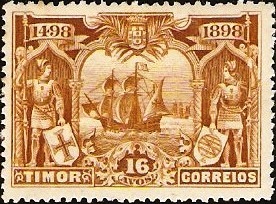 This Timor stamp is one of a series issued in Portugal and her colonies in 1898. The difference between the bow-mast and sail of the Chinese junk and the bow-sprit-sail of the fifteenth century is clearly shown in the Timor stamp (10), showing Vasco da Gama’s flag-ship, the Sao Gabriel. In this vessel, da Gama, with two consorts, first found the sea route round the Cape of Good Hope to the East Indies in 1498. Thus, after having passed over the world and through the centuries, the bow-mast and sail of the Chinese junk returned to the East as the bowsprit-sail “invention” of Europe. The lateen sail came into common use in the Mediterranean about the sixth or seventh century. Up to then the square-sail had persisted and in a stamp of Tunis (11) we have a picture of a Carthaginian galley, showing a mast stepped practically amidships, with a steering oar over the quarter and two square-sails set one above the other. The artist has taken liberties with the angle of the sail, as the Egyptian artists did. The angle of the sails here would indicate that the ship is making progress with sails trimmed to a wind almost abeam, but this is certainly wrong, because such sails in such a position on the mast would be a hindrance rather than a help. A square-sail on a ’midship mast was still for use only with the wind almost dead astern. With any less favourable direction of the wind it was the practice to lower the sail and depend on the oars. 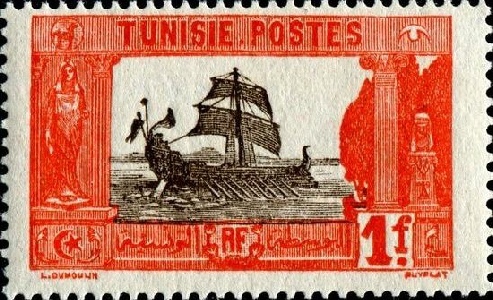 (11) CARTHAGINIAN GALLEY, with two square-sails set on a mast amidships This Tunisian stamp was issued in 1906. Although the square-sail was used in northern Europe as well as in the south, there was a definite difference in the methods of shipbuilding. The ships of the south showed a marked distinction between the shapes of the bow and those of the stern. The northern ships retained a “double-ended” type, with little or no difference between bow and stern. The Norse galleys were typical of north European ship design, and it is surprising that even after the Roman conquest and the colonization of Gaul and Britain, the northern type persisted against all the influence of the south. We have learned full details of the construction of these northern boats from remains recently excavated. 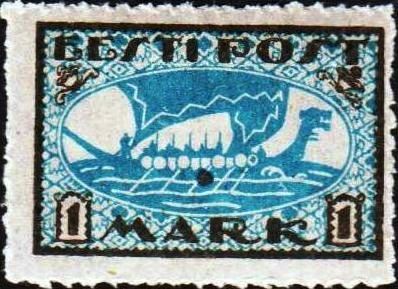 (12) A GALLEY with bows and stern differently shaped is shown in the Estonian stamp issued in May 1919. The “Nydam boat” was dug up out of a marsh in Schleswig in 1863, and coins and other evidence found in her date her about A.D. 217. Her remains are in the Kiel Museum. Another boat found at the same time was unfortunately destroyed. This boat was fitted with a form of beak or ram at either end. In the London Museum is preserved a specimen of shipbuilding of about the same date; and at Oslo (Norway) are two well-preserved examples of the Viking ships, five to six hundred years later in date. From such evidence we have an exact knowledge of the Viking ships of northern Europe. There are three postage stamps that illustrate this type of vessel. The Estonian stamp (12) shows a galley with bow and stern differently shaped, although according to archaeological evidence we know that this is incorrect. In the “Norse-American Centennial” stamp (13) we have a galley more correctly drawn as to the shape of bow and stern, the proportion of the mainsail and the position of the mast. The ship, however, is given a jib-sail that was certainly unknown in her day and for centuries after. There also appears to be a deckhouse or deck, with an awning over it for a quarter of the length aft of amidships. This is doubtfully correct, for most of the specimens excavated, even of a ninth-century type, prove that the ships were generally undecked except for a little space right in the stern for the steersman. (13) THE SHAPE of a North European galley is more correctly shown in the United States stamp, although the jib-sail is incorrect. This stamp was issued in 1925. 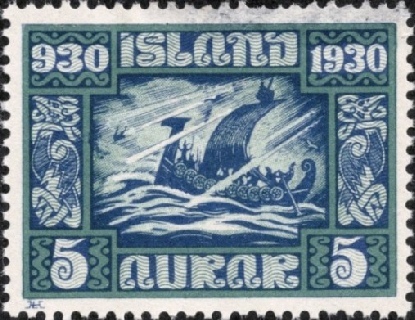 The ship on the Iceland stamp (14) is more correct, although the artist has drawn different shapes of bow and stern. The vertical stem is also wrong, because all precedents favour the curved stem as seen in the American stamp (13). (14) THE VERTICAL STEM of the galley on the Iceland stamp, issued in 1930, should be curved. The United States stamp (13) shows the more correct form. From about the sixth century the lateen sail rapidly displaced the square-sail of the Greeks and Romans in the Mediterranean. It scarcely appeared outside the Strait of Gibraltar for centuries after, and then only as a subsidiary to balance the ship’s sailing. In the picture of Vasco da Gama’s ship (10) we have already seen how the lateen sail was used as a mizen. The word mizen is derived from the Arabic word mizan or misan, meaning a balance or compensation, and because such a balancing sail could either be placed right fore or aft, the sail was first brought north as a mizan placed in either position. The meaning of the English word mizen is corrupted when it denotes an after mast and sail, and the French word misaine, also corrupt, means a foremast. The extreme to which the lateen was developed as the primary sail is illustrated - perhaps with a little artistic licence of exaggeration - in the spirited picture on a Fiume stamp (15) of a Venetian galley under two huge lateen sails and rowing a single bank of oars. (15) A VENETIAN GALLEY with two huge lateen sails and a single bank of oars. This represents the extreme development of the lateen sail. 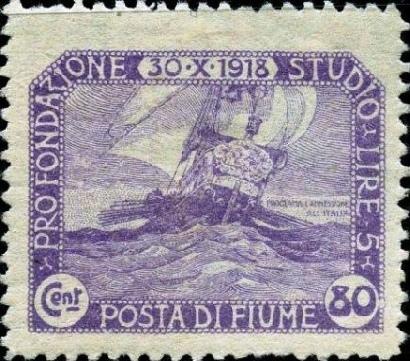 The Fiume stamp was issued in May 1919, to mark the 200th day of peace after the war of 1914-18. All stamps of this issue were sold for charity at 5 lire above their face value. It is almost certain that such a galley would be a warship, because we know that as far back as the second century the Roman merchant and cargo ships depended on sails rather than on oars. The warship, however, was propelled by oars because oars either helped the speed under sail or allowed the ship to be manoeuvred and steered in any direction with the sails furled. A sea battle in the days of oared galleys was normally fought under oar power. A primary aim of opposing ships was to drive the stem into the enemy’s oars and splinter them. The rowers would be killed by the blows of the violently jerked ends of the heavy oars. Sometimes the galleys would crash their under-water war-beaks into the enemy’s hull. (16) THE WAR-BEAK of a galley sailing from Tripoli on the North African coast. These rams were used to crash into and break an enemy vessel’s bank of oars. This Libyan 50-centesimi stamp is one of a series issued in 1921. 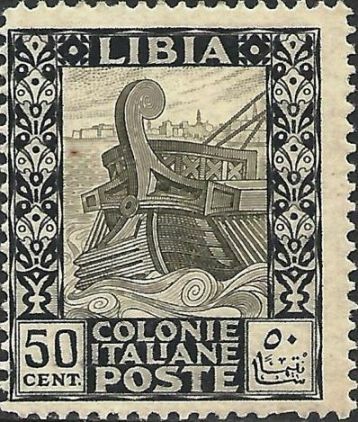 A Libyan stamp (16) shows a ram on a galley leaving Tripoli. This North African port was once the stronghold of corsairs who preyed with such success on the shipping of all nations that many countries paid an indemnity for immunity against attack. This payment continued so long that in 1801-5 the United States were at war with Tripoli because of a refusal to increase the indemnity demanded. In 1803 a U.S.A. frigate, the Philadelphia, went ashore on a sunken rock while in pursuit of a corsair. So strong were the sea defences that it was only by a land expedition of the American forces that Tripoli was finally subdued. When sailing warships adopted a jib-boom and bowsprit on which to set their head-sails, this projected so far forward as to make an under-water war-beak useless and it was discontinued. 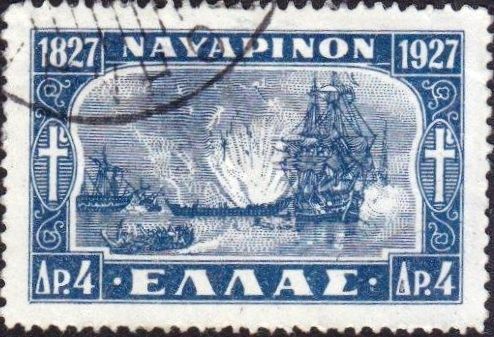 The shape of the bows of a battleship and the forward curve of the stem from the water-line into the jibboom is seen clearly in the picture on a Greek stamp (17) of a warship in the Battle of Navarino. This battle was fought in 1827 by the British, French and Russian fleets, united for the protection of Greece against the Egyptians and Turks. (17) THE BATTLE OF NAVARINO was fought off the west coast of Greece in 1827, during the War of Greek Independence, by the British, French and Russian fleets against the Turks and Egyptians. One hundred years later this Greek stamp was issued. It illustrates the type of warship that was in use in 1827. Some years earlier, Robert Fulton, the American inventor, had designed a steam-propelled warship of thirty-eight tons. This was launched as the Fulton at New York in 1815. She had a bow strengthened and shaped to act as an underwater war-beak or ram. This design came to be standardized in the warships that had their bows curving forward down to and under the water. An example of this shape is seen in a Greek stamp (19) showing the armoured cruiser Averoff. What appears to be a ram is seen on a Togoland stamp (18), of a design common to all the German colonies before 1914. The bow was shaped in this manner for buoyancy forward. The vessel is the former German Emperor's steam yacht Hohenzollern. 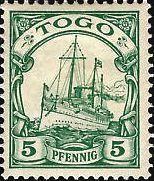 (18) The stamp illustrated here was issued by the German colony of Togoland. Examples of these stamps were overprinted during the Anglo-French occupation early in the war of 1914-18. Another stage in the development of the sailing ship was marked by the use of more than one mast. Although lateen-sailed two-masters were common in the Mediterranean by the eighth century and King Richard I sank a Saracen three-master during the Third Crusade in 1191, there is no trace of more than one mast being used in northern European waters until the end of the fourteenth century. Then the mesan was adopted in two-masters. After the principle of a small balancing sail had been established, it was soon found that three masts made a further improvement. It was realized that the forward balancing sail could most effectively be used on a small square sail on a yard under the bowsprit and that the best after-sail was the triangular lateen. 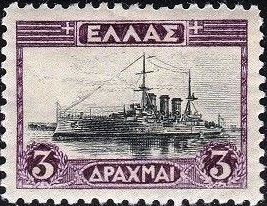 (19) A BATTLESHIP RAM is formed by the bows of the Greek cruiser Averoff, 9,450 tons displacement, depicted in the 3-drachmae Greek stamp, issued in 1927. 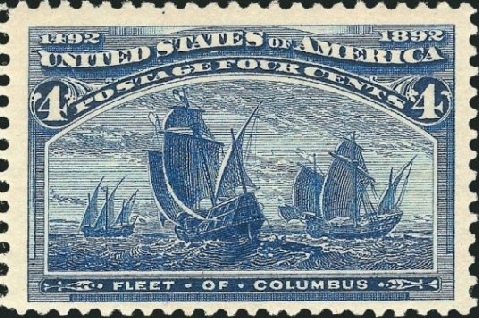 The rig of the ships of the fleet of Columbus in the U.S.A. “1492-1892” commemorative stamp (20) shows at a glance the main principles of masts and sails then firmly established. They were almost unchanged for the next hundred years, and modified only in minor details to become the most efficient rig known in sail. The ship on the right of the picture shows best the detail of the three masts - a foremast carrying a large square-sail, a taller mainmast with a big mainsail and a square topsail above it and a mizen-mast with a lateen sail. Forward, under the bowsprit, is the square bowsprit-sail. (20) THE CARAVELS OF COLUMBUS are shown in this United States stamp, one of a series issued in 1893 during the Columbian Exposition at Chicago to commemorate the discovery of America. Design and rig were scarcely altered during the next hundred years. 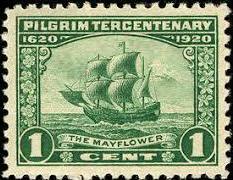 The “Pilgrim Tercentenary - 1620-1920” stamp (22) illustrates the Mayflower. Here the Mayflower has the same sprit-sail, the same square-rigged foremast and mainmast, and the same lateen mizen as Columbus had in 1492. The only difference is in the setting of a topsail above the foresail. The foremast of the Mayflower is also stepped a little farther aft and so can be stayed more strongly. Vasco da Gama, however, set a small topsail on his fore-mast (10), so that the Mayflower rig of 1620 is almost the same as that of the Sao Gabriel of 1498. It was not until a long time afterwards that the next improvement in rig was made by the use of the ropes staying the foremast to carry a jib-sail between the top of the foremast and the jib-boom. Small boats had set such fore-and-aft jib-sails for many years before this method was introduced into the larger ocean-going ships, but once the principle was established such head-sails quickly replaced the square sprit-sail set below and across the bowsprit. Before the jib-sails came in, another set of sails was added above the bowsprit-sail on a yard that crossed a rather clumsily rigged jack-staff which rose upright from the bowsprit. 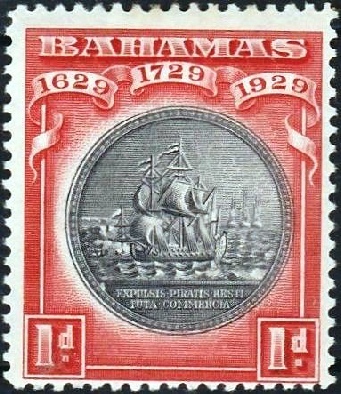 A picture of this is given in a stamp of the Bahamas (21). Such a rig was in the way of any sails set on the stays running from the mast to the bowsprit, and was later discarded. (21) A TYPE OF RIGGING that has been discarded is shown in this Bahamas stamp issued in 1929. A set of sails was added to a jack-staff that rose from the bowsprit. Such a rig was in the way of sails set on the stays running from the mast to the bowsprit. With the bowsprit cleared of crossing yards, it was now possible to add to the number of stays forward from the fore mast to points along the bowsprit. Later, stays were added to the jib-boom projecting beyond the bowsprit and finally to the outermost flying jib-boom. A simple step was to stay the mainmast to the foremast and the mizen to the main and to set stay-sails on these various stays. (22) THE FAMOUS MAYFLOWER that carried the Pilgrim Fathers to America in 1620 is illustrated in this United States stamp, issued to commemorate her tercentenary. The Mayflower’s rigging was almost the same as that of the Sao Gabriel, illustrated at (10) above. 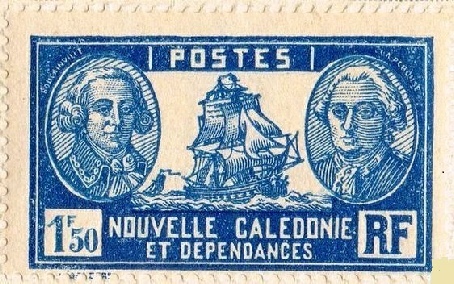 This change to jib-sails is shown on a stamp of New Caledonia (24), on which appear also portraits of De Bougainville and La Perouse, two famous French navigators and explorers. The ship appears to date from about 1750 to 1760, a period that would agree with her rather clumsy, full-bodied hull, highly steeved bowsprit, and general sail plan. The lateen mizen was in use until the beginning of the seventeenth century, and about the middle of that century it had been accepted that the part of the sail which came forward of the mast had little power. This forward half was cut away, leaving the long lateen yard slanting up aft from the deck to the mast without any sail on it. The forward edge of the sail was left aft of the mast and laced to it, but the sail-less lower part of the lateen yard was left there for a time. Then someone found it could be dispensed with by cutting it off where it crossed the mast and making a fork or “jaws” to hinge the upward slanting after part to the mast. So the lateen gave place, after a long period, to its present-day descendant, the spanker sail. 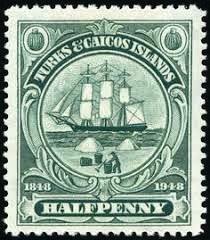 (23) THE EIGHTEENTH CENTURY SHIP on the Turks and Caicos Islands stamp has no square-sail on her mizenmast below the top-sail. On the stamp of the Turks and Caicos Islands (23) is illustrated a vessel whose foremast and mainmast carry the square sails from yard to deck level, and the mizenmast has no square-sail below the topsail. (24) SHIPS OF THE EIGHTEENTH CENTURY were the first to carry jib-sails. The stamp of New Caledonia shows also the portraits of Bougainville and La Perouse, two famous French navigators. The sweep of the sailless lower half of the lateen yard across the lower part of the mast prevented any sail from being set across the lower mizenmast. After the useless part of the lateen yard had been cut off, although there was no longer anything to interfere with a square-sail being set at the foot of the mizenmast, no sail was spread there, The yard below the mizen topsail was left bare of sail. This became known as the bare or barren yard - la vergue seche as the French called it. with the spanker protruding astern of it. The same plan was followed on the mizen of a three-masted vessel. 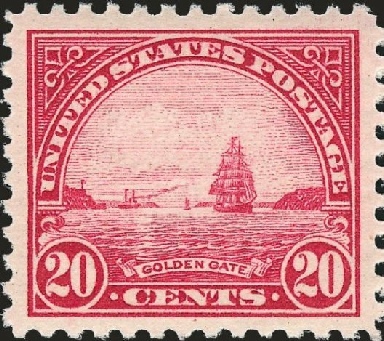 (25) A CLIPPER SHIP entering the Golden Gate, San Francisco, is shown on this 20-cents United States stamp, issued between 1922 and 1927. Ship development in the clipper times consisted mainly of the improvement in the lines of the hull and the piling on of sail to give more speed. Studding-sails were set on booms extended from the yards and almost doubled the width and driving power of the square-sails. The Great Republic, for instance, 330 feet in length and 53 feet in breadth, had a mainyard 120 feet long. The vessel on the Liberian stamp (28) shows clearly how the studding-sails or stu’n-s’ls, increased the area of the square-sails. This ship has them set on two of the foremast sails only, but the racing clippers carried them on all square-sails whenever the wind served. A nother picture of these sails is in a United States stamp (26) showing the sloop Restaurationen. In her the first batch of Norwegian emigrants reached New York in 1825. It is in commemoration of this event that she is shown in the “Norse-American Centennial” stamp of 1925. Here again two stu’n-sls are set on one side only of the sails, but they serve to convey an impression of the appearance of the clippers, with the stu’n-s’ls set outside every sail from sky-sails down and on all three masts. 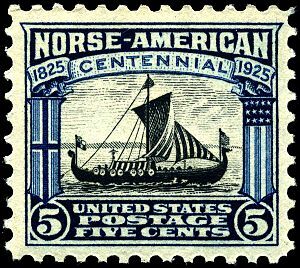 (26) The sloop Restaurationen that brought the first Norwegian emigrants to New York in 1825 is shown in the Norse-American Centennial commemorative stamp. Economic pressure and the competition of steam forced the cutting down of the clippers’ vast sail area. Ships could not afford to carry the large crews required to handle such masses of sails, and one after another they were reduced in size or abolished. 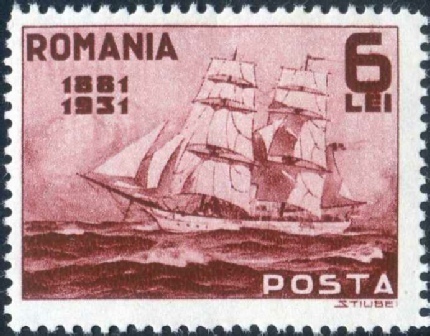 (27) A BEAUTIFUL BRIG used as a cadet training ship is shown in this Romanian stamp issued in 1931. A spanker sail can be seen astern of the lower square-sail on the mainmast. 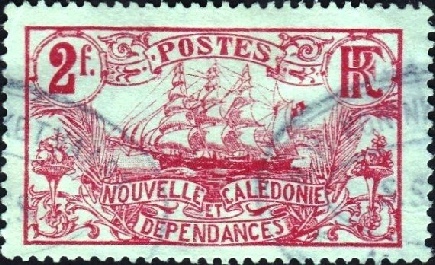 The 2-franc stamp of New Caledonia (29) gives us a good picture of the reduced sail plan that came into general use in the later days. The use of iron and steel allowed the building of longer and stronger ships, and the number of masts increased to four, five and even six. One United States stamp (25) shows a magnificent picture of a clipper ship entering the Golden Gate - the entrance to the harbour of San Francisco where so many of the California clippers drove in after the fierce, hard-fought battle round the Horn in the gold-rush days. (28) STUDDING-SAILS, or stu’n-s’ls, are set on two of the sails of the foremast of this ship illustrated in a Liberian registration stamp that was issued in 1923. The object of these stu’n-s’ls was to increase the area and driving power of the square-sails. It might almost seem that this stamp was designed to symbolize the doom that was already overshadowing the glory of sail and the reign of the proud clipper ship queens of the ocean. For beyond the ship sailing in and beginning to shorten down for her anchorage, we see a black speck and a trailing smudge of smoke across the far horizon - proclaiming the coming of steam. (29) THE REDUCED SAIL PLAN of later sailing vessels is shown in this stamp of New Caledonia issued in 1905-7. Iron and steel permitted the building of stronger ships, and the number of masts could be increased to six if required. You can read more on “Ships in Miniature”, “Standing and Running Rigging” and “Speed Under Sail” on this website.